There is a beautiful selection of Dovecraft Pearl Effect glues to choose from, so pick your colours and get designing! 1. Begin by cutting a 16.5cmx12cm rectangle out of a sheet of Dovecraft Kraft card. 2. Replace the blade in the Trimcraft 3 in 1 paper trimmer with the scalloped plate. Trim along each edge to achieve a crimped effect. 3. Choose your colours from the Dovecraft Pearl Effects bright collection. Take your first colour and squeeze a sizeable amount out onto your kraft card. 4. Take the nylon brush from the First Edition brush set and begin brushing your first colour in short, gentle sweeps. 5. While your glue is still wet, squeeze your next Pearl Effects colour onto your card and follow the same brushing technique. Vary your design by spreading out as well as overlapping the different coloured glue on your card. This will allow you to create interesting shades of colour across your design! TIP: Make sure to not over brush your card as this will lose the textured effect that the bristles have given you. 6. Build up the colour then leave to dry, repeat the same steps to build up texture then leave to dry again . 7. 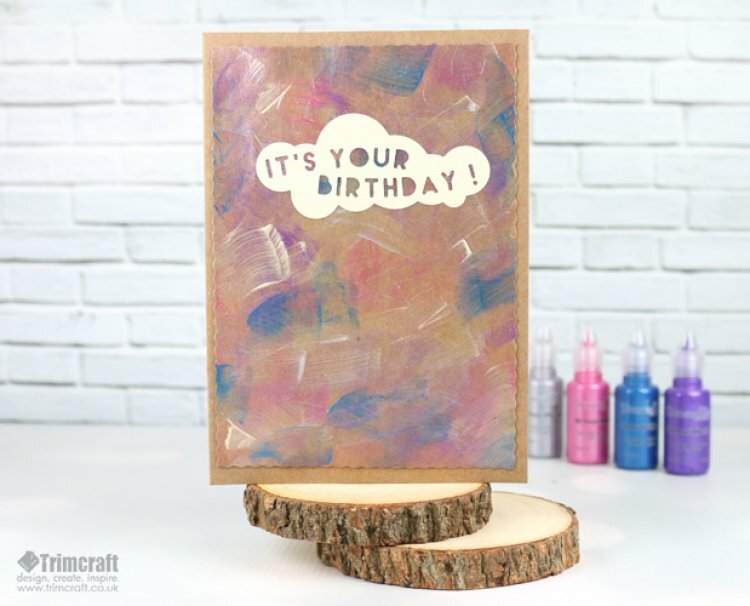 Take the ‘It’s your Birthday!’ sentiment from the First Edition Birthday die set and die cut it onto a cream sheet of First Edition Textured Cardstock. 8. Adhere your sentiment near the top of your kraft card and glue your design to the centre of your Dovecraft Kraft card blank to allow space for a border. The Dovecraft Pearl Effect glues are sure to leave a brilliant shine on your makes and with the help of the First Edition brushes, you’ll be able to get a fab texture too! How will you use the Dovecraft 3D Pearl Effects Glue? Upload your lovely crafts to the project gallery and when uploading to social media, remember to #Trimcraft so we can see your fabulous projects!